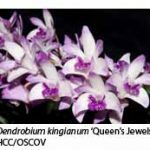 Undoubtedly the most commonly grown Australian native orchid, at least in the southern states, is Dendrobium kingianum. This native of New South Wales and southern Queensland adapts well to Victorian conditions and soon develops into a fine specimen plant. It has the nasty habit of dropping many of its leaves if exposed to frost but it does well with the minimal frost protection of a fibreglass roof in my back garden. The most common flower colour is pink but there is also a white form and the so-called variety Silcockii, which is white with a contrasting purplish lip. 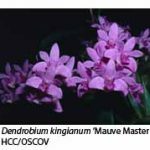 Selective breeding has now produced cultivars with purplish red and speckled pink flowers. 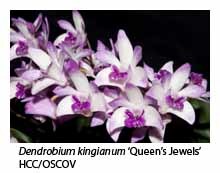 The main reason that D. kingianum is so common in cultivation is its propensity to form offset growths, often referred to as keikis, keiki being the Hawaiian word for baby. According to the late Maurie Black, a prominent early NEMOS member who was fanatical about correct spelling and pronunciation, the word should be produced cay-key but I, like most others, say key-key. Keikis develop from the upper leaf nodes and eventually grow roots, at which time they may be removed and re-potted in the same way as seedlings or divisions. 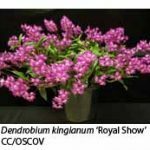 New growers are often pleased to see their plants develop keikis but they should remember that these keikis are being produced at the expense of flowers. Those interested in a good floral display should remove the keikis before they develop, a simple twist of the wrist being sufficient to remove either them or the fully developed keikis. 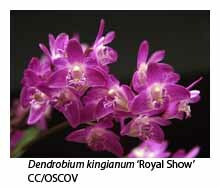 Some cultivars of D. kingianum seem to be much more prone to develop keikis than others. 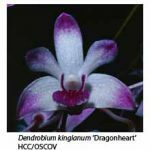 The use of high-nitrogen fertilisers promotes keiki production, and the use of a potassium-rich or balanced fertiliser is therefore recommended (as it is for all native dendrobiums). Plants with poor root systems, the result of old, decayed potting mixes, are also prone to produce keikis, probably as a last-ditch effort to survive. 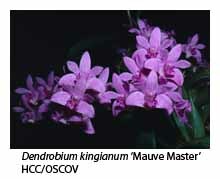 Keiki formation is not restricted to D. kingianum, many of its hybrids also yielding keikis, although not as prolifically as the parent species. 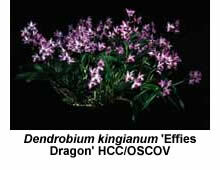 Other dendrobium species, both native and exotic, also produce keikis. 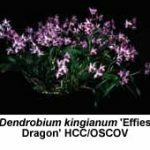 My plant of Dendrobium moorei, a native of Lord Howe Island, develops keikis occasionally, while that well-known soft-cane dendrobium, D. nobile and its multitude of hybrids, regularly produce keikis, especially if fertilised during winter. Why is Dendrobium kingianum in nature so prone to produce keikis? Is this property a survival strategy designed to enable the plant to survive the catastrophic loss of its root system? In nature D. kingianum grows mainly on rocks, where its roots follow cracks and crevices filled with leaf litter. Most keikis dislodged from the parent plant will simply fall into the same area, although conceivably some may slide down the hillside to a more favourable environment elsewhere. Just another mystery of life, I guess! As long as the species keeps developing keikis, there will always be a glut of “kingies” on the sales bench. It puzzles me why many members keep propagating inferior forms of the species when so many superior forms, produced by line breeding, are now available. In general, these have larger flowers held on strong, upright stems, sometimes produced two to each node, which leads to an impressive floral display. 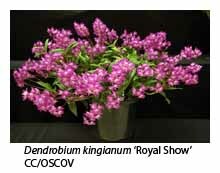 These cultivars take no more time and effort to grow than many old bush-collected plants that often have weak stems and drooping flowers. 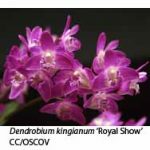 Most members, after a little experience, discard their early cymbidiums in favour of newer hybrids, so I suggest you cull your Dendrobium kingianum plants, too, in favour of those with superior flowers.